A prototype is a sample garment of your custom group order, and it is created to ensure you love everything about your new look. Custom garments are completely unique, so your costume company will need to test the pattern and design before you both invest more money and time in a group order. You'll want to make sure you get a prototype made if you're creating a custom design. This includes designing a dance costume from scratch, as well as taking a style you like and modifying it, like adding a skirt to a leotard. For many companies where customization isn't an option, a sample garment of a specific stock style is another option. This is also a great way to see if you like a costume before purchasing it! A prototype/sample garment is the best way to ensure that your group order will look and fit the way you want! It is your tool for checking fit, design and overall performance of the garment before your entire order is created. Prototypes are also used as a sew sample tool by your costume company. The production team will use it as a guide to ensure all of your costumes are created the same way. What do I do with a prototype? Try the garment on as many team members as possible to make sure the fit is consistent for each dancer. Make sure to try it on with the tights, shoes, and accessories you'll be using for your performance as well! Be sure to move in it! Perform your choreography and move in your costume. Have team members dance in the garment and perform turns, leaps, floor work or kicks. Note desired changes, if any, to the garment. If the skirt feels too short when you move in it, now is the time to note the changes you'd like to be made. Taking pictures is a great way to show your costume company any concerns! Measure and size your team. Recording your team's measurements on a spread sheet like this one, and using the sample garment as a sizing guide. Need help with measuring? Check out this How to Measure video tutorial! Ship the sample back. Many companies use the sample garment as a guide for sewing the rest of the costumes. Wondering what specific things you should check? Check out this sample proto checklist - it's a comprehensive list of all the things you should pay attention to with your sample garment! It depends on the company, but at The Line Up a prototype is the full price of your garment. Some companies charge a flat fee of $200 or more. It's important to note that you can recover the cost of your proto if minimal changes are made and you are able to use it in your final order! How long does it take to create my proto? Time frames vary depending on the complexity of your garment and the time of year, but for most companies, prototypes are created in 2-4 weeks. What if I make changes to my prototype? 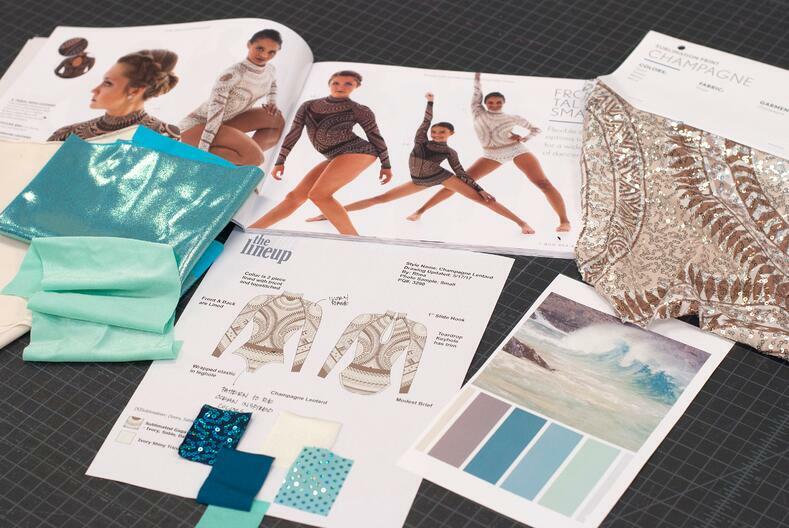 If you are creating a custom design, more likely than not you may have a few tweaks to your custom dance costume. That's okay and to be expected! If changes are minimal, the prototype can often be altered or used with the final order. But if changes are more significant, you will have to make a second prototype, which will add to your time frame as well as costs. For example, fit changes are easy to address, but changes to style lines or fabrics are more significant and would require a second prototype. Our best advice is this: make sure your design, concept, and choreography is solidified before you create a proto! This is to save yourself time, money, and avoid redesigns! So there you have it - a prototype is a little investment in time and money up front, that will ensure your custom costume WORKS for both you and your costume maker. And because custom costumes are often non-returnable, this up-front investment will pay off in the end once the larger investment in a group order is made. We highly recommend it! For more information about the prototype process at The Line Up, check out our Prototype information page, or contact your Account Manager!